This year's Jakarta Culinary Festival (henceforth: JCF) sees a lot of culinary stars both local and international. Among those most anticipated are Mario Batali, George Calombaris and the Bliss sisters. If you've no idea who they are, just click on their names to find out. Tickets for 1-day entrance is at IDR 20,000/pax/day, which would entitle you to 1 choice of beverage, either: Guinness Beer / cocktail (choice of Singapore Sling or Chocolate Martini) / coffee by Djournal Coffee (hot or cold). Sounds like a darn good deal? Hell yeah! If youre visiting ore than one day, multiple days entrance ticket is recommended, which is priced at IDR 50,000. Tickets for the degustation dinners and cooking sessions with the celebrity chefs has to be booked in advance. Prices vary. For more details, just call the hotline number at the bottom of this post. The goodie bag was honestly, not the lightest to carry, especially if you're lugging 2 litres of milk around! But all that was soon forgotten as I drenched myself in the lively and buzzing atmosphere. The opening night was jam-packed and the seats at the cooking theater filled up in no time. I was star struck there, meeting international and local celebrity chefs. 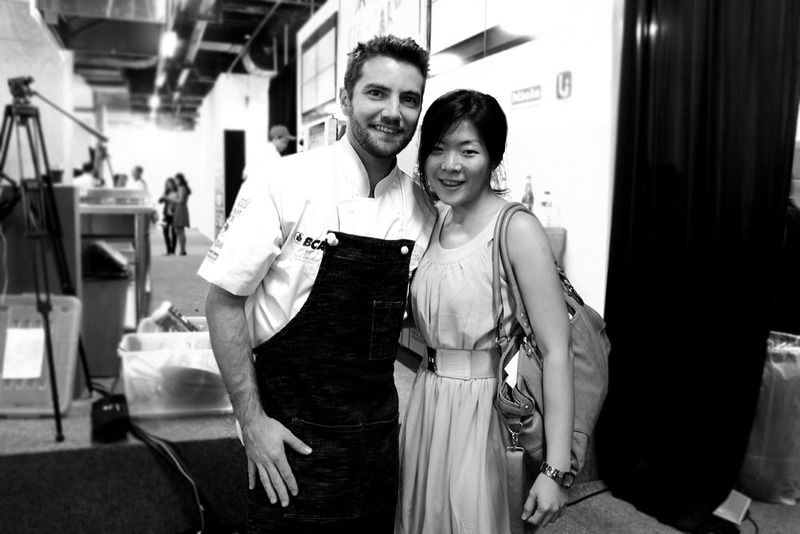 I spotted Marcel Vigneron of the US series Top Chef and Quantum Kitchen. In fact I wasn't sure if it was really him at first, but I braced myself to randomly approach him and he confirmed my guess with a resounding "that's me, in person". No time wasted, I quickly "borrowed" him to take a picture together. And my! he's such a friendly guy. The opening night was also attended by who's who in the society such as Andrew Darwis of Kaskus, Marcell Chandrawinata, etc. But my greatest fun was NOT star-spotting, it was actually meeting notable personalities in the local culinary scene, like William Wongso (Culinary Expert), Yohan Handoyo (Wine Expert) at the pop-up restaurant. Although I was not as fortunate as some of my friends who were invited to Will & Will's opening night dinner, I felt equally bubbly, just dropping by and say 'hi' to my friends, fellow food bloggers, media editors, chefs, etc. So before the session starts, I'll be doing grocery shopping with Chef Raj, who will give us tips on how to pick the best produce for home-cooking. Oh yes, they're going to record it and the video will be shown at the cooking demo. Honestly, I'm not very keen to pose in front of the camera, but as this is a personal request... ;) So, what are you waiting for? Who's going to JCF 2012? wow, you are so lucky girl... Im envy... Write more about it. 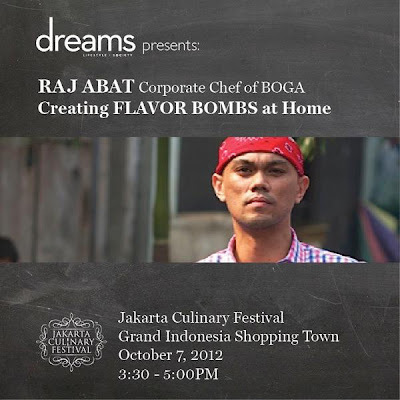 Lovely, among the events which made me envy Jakarta bloggers. Did you have a chance to visit it the other days?